From the 2017 Italian Furniture Fair "I Saloni Milano" a new exciting Italian made sofa bed has been added to our collection, featuring a massive 18 centimeter height mattress! Most definitely a very comfortable mattress, made of large and tall pocketed springs, produced by Simmons. Modern Italian Design, essential design and highest quality. 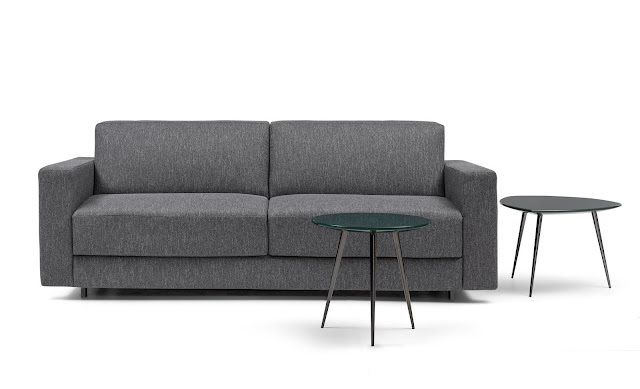 You can check our range of sofa beds on our website http://www.momentoitalia.com/tutti%20file/living_sofabeds.htm where you will find a range of modular sofa beds, sectional sofa beds with storage and compact sofa beds boosting largest queen size mattress. All of the sofa beds are made in Italy and imported from Italy, and are available in multiple different fabrics and leather. Looking for a high quality modern sofa bed is not easy task. There is so much to look through, especially over the internet, and so much confusion about costs and quality. We are specialized in Italian top quality modern sofa beds which are the best you could find on the market, designed in Italy and manufactured in Italy. Sofa beds might look all the same but just really looking at one you can tell the difference, oh well, after more than 20 years in the business, at least we can! There are so many details making the difference in the cost of a modern sofa bed, starting from the core, the sofa bed mechanism. Our modern sofa beds are extremely easy to open. Most of the sofa beds from our collection feature a one touch operation system: simply pull the sofa back forward to unfold a full, queen or even king size bed; this is so easy why would you need any other way? some of our customers requested electrical operated sofa beds but would you pay more money and go through a hassle of maintenance and repair when having a manual operated sofa bed is that easy? While opening the sofa bed all the cushions stay attached to the structure so you do not need to remove anything to convert your modern sofa bed. Seat and back cushions are safely stored underneath so at the end, you will never sleep where you seat, and will keep your seat and back cushions neat and clean for longer time. Start from one simple armchair which becomes a single bed or choose a two or three seats sofa bed which converts into a queen or king size mattress. If you have the space, add an ottoman with storage or create a large compositions or L shapes with chaise lounges featuring storage space or end elements to maximize the seating space. You can even create corner compositions.